This simple Breakfast Casserole is a classic. With a few basic ingredients, you have the perfect breakfast that everyone will enjoy. It’s perfect for mixing up the night before and baking in the morning. 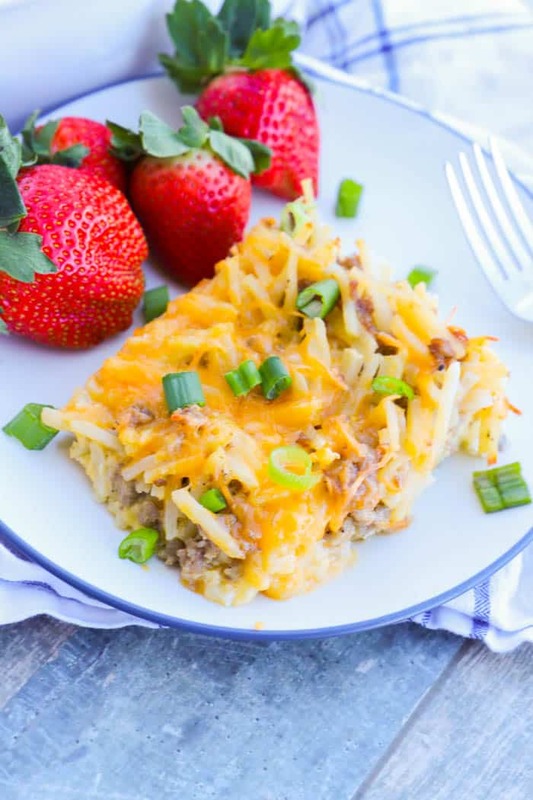 Breakfast casseroles are one of my favorite things! My entire family loves them and we often eat the leftovers (if there is any) for lunch! They also are the perfect recipe to make ahead and serve in the morning. More time in bed in the morning is always a good thing! One: Preheat oven and prepare a casserole dish with non-stick cooking spray and set aside. 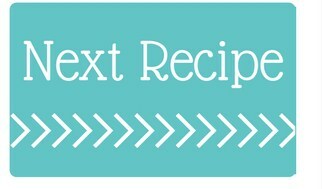 I used my standard 9×13-inch casserole dish for this recipe. Two: Cook ground sausage to the skillet until almost cooked. Then drain fat and add in diced onions and minced garlic. Allow to cook for a few minutes then remove from heat. You want them to cook just until your onions are translucent. Remember they will cook more while in the oven but can burn quickly on the stove top. Three: Add that cooked sausage and hash brown potatoes to the prepared casserole dish. Four: In a separate bowl whisk together eggs then season with salt and pepper. Pour this egg mixture into your casserole dish with 1 cup of cheese and mix. Before baking, I add remaining cheese to the top of your casserole. Cook for 40-45 minutes at 350 degrees F. The casserole is done when the eggs are firm and cooked through. You can always put in a butter knife and see if it comes out clean. Freezing: Cook the casserole according to the directions and allow to cool completely. Cover the casserole dish and place into the freezer. When you are ready to bake then allow it to thaw overnight in the refrigerator. You may need to increase the bake time by 10-15 minutes to get it warm throughout. This casserole can stay in the freezer up to 3 months. Refrigerating: To make this the night before you can mix all stop at after step 4. Cover and place in the fridge to be baked in the morning. You should not need to add any cooking time but always check before serving to make sure the eggs are cooked throughout your casserole. Ham and Potato Breakfast Casserole: This one is a favorite with my husband. 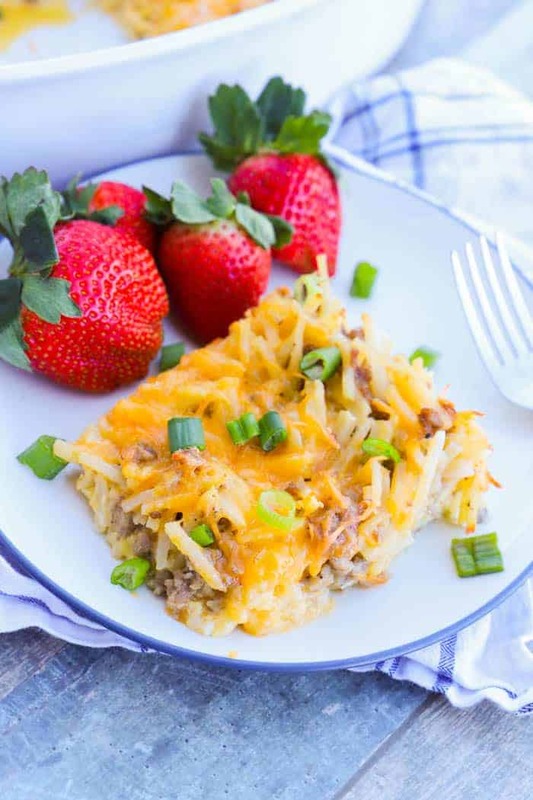 He loves ham and I tossed it in this simple breakfast casserole to make the best ham and potato casserole out there. Biscuits and Gravy Casserole: This recipe reminds me of my Granny and is one of my favorites. She loved sausage gravy and growing up made it for me all the time. I loved staying at her house and getting her homemade breakfast in the morning. This recipe is her sausage gravy but with biscuits baked on top all in a casserole dish. 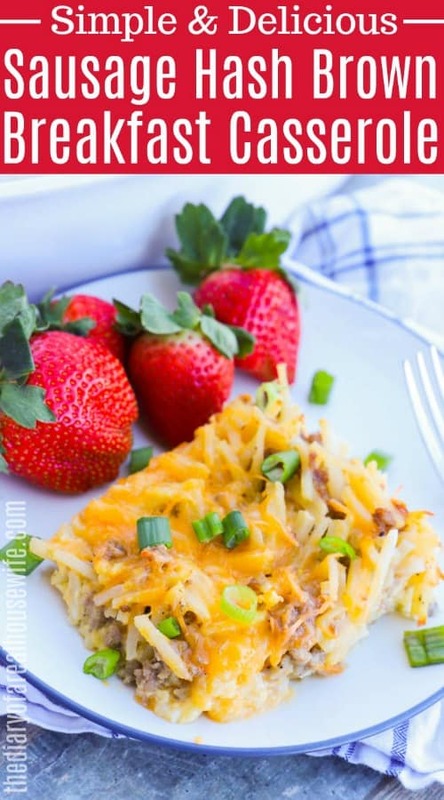 Low Carb Breakfast Casserole: If you want something a little lighter you have to try this recipe. It’s simple to make and taste amazing. Cook ground sausage to the skillet until almost cooked. Drain fat and add in diced onions and minced garlic. Allow to cook for a few minutes then remove from heat. Add that cooked sausage and hash brown potatoes to the prepared casserole dish. Add remaining cheese to the top of your casserole. Cook for 40-45 minutes until eggs are firm and cooked through. My mom made something like this. She called it “Guests are over breakfast”! She usually made two pans of it and mixed it entirely the night before. Then when she got up, she preheated her oven (In her jammies) and started the coffee. Start the shower water and while it got hot she would run back and put these in the now warmed oven. By the time she was done showering, the house smelled amazing and she just had to add the cheese and get Sour cream and salsa on the table!